Is there a way to say “tentative” in French? Of course–see below for a bunch. And, there are French words that look/sound like “attempt”–attent, and attentat. Of course, they don’t mean anything like “attempt”–more false cognates. la tentative: an attempt, a try. la tentative de meurtre: murder attempt, attempt on someone’s life. la tentative de suicide: suicide attempt, attempted suicide. une attente: wait, waiting, waiting time; expectation. un attentat: attack, bombing, assassination attempt; offense, outrage. provisoire, expérimentale: tentative, in the sense of not committed. timide, indécis, hésitant: tentative, in the sense of a thought, idea, or person. I just got the reviews of my first conference paper submission in French. (I wish I could say that I dared to write it in French, but no: one of my co-authors, a native speaker, translated it from English, with, of course, many additional contributions.) The reviews illustrate a couple of interesting grammatical points, and of course, thanks to Zipf’s Law, they bring up some new vocabulary items. The interesting grammatical item: the definite article in L’article, qui n’est pas en soi une contribution scientifique (mais ne prétend pas l‘être)… “The article, which is not itself a scientific contribution (but does not claim to be)…” I’m not sure what that epenthetic article is called, but I’ve heard this type of construction before, most notably in an episode of Coffee Break French, Season 4, where it was talked about at some length. There’s clearly no English equivalent, but it is required in French, as far as I know. PS: Yes, the paper was accepted! If you’ve been following this blog for a while (or read the About page), you know that Zipf’s Law has an effect on vocabularies: every language has a very large number of words that occur only rarely. The Poisson distribution describes distributions of rare events, and predicts that even rare events will sometimes occur in clusters. No movie stars die for a year, and then three of them die in a month–that kind of thing. If you think about the interaction between Zipf’s Law and the Poisson distribution, you have the fact that every day, a second language learner will run across words that they’ve never seen before–a consequence of Zipf’s Law–and you have the likelihood that they will sometimes occur in unexplained clusters–a consequence of the Poisson distribution. This interaction was illustrated for me today by the expression mettre en examen. 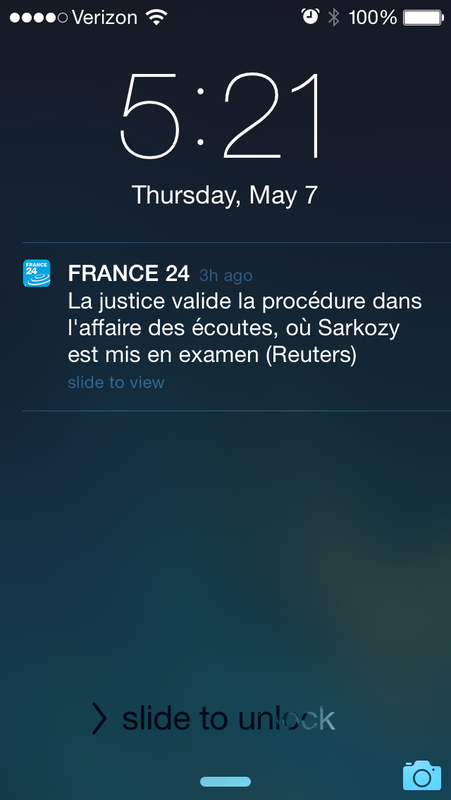 After not having come across it in 16 months of intensive French study, I came across it just a couple of days ago in a book about English serial killers, and then this morning, it showed up on my phone as an alert about a news story about Sarkozy’s legal troubles. Zipf’s Law + the Poisson distribution: you live into your 50s without ever seeing a word, and then you see it twice in a couple of days, in totally unconnected circumstances. mettre en examen: WordReference.com defines it as “to investigate” or “to place under formal investigation.” In the book that I’m reading, it was translated as “to suspect.” I guess I probably trust WordReference.com more, but that is such data as I have. wire-tapping, phone-tapping: Le journaliste est sur écoute. “The journalist’s phone is tapped.” Note the pronoun sur. audience; (TV) viewing figures; (radio) listening figures. There’s an additional meaning related to the nautical speed of a ship, I think, but I can’t quite figure it out. I’m not that comfortable in French, but I’m told that I speak it “well, for an American.” It turns out that this means that I speak French about as well as a Spanish cow. 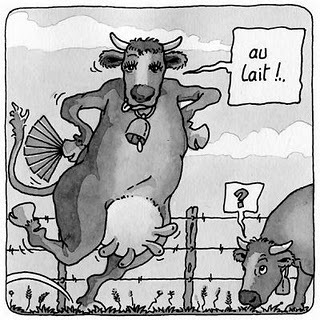 This is the expression for speaking French poorly: parler français comme une vache espagnole, or “to speak French like a Spanish cow.” I can’t really think of a clever English-language equivalent. It turns out that if you do a search on vache espagnole (Spanish cow) on Google Images, you find quite a bit of stuff. I’ve posted some of the better pictures here.